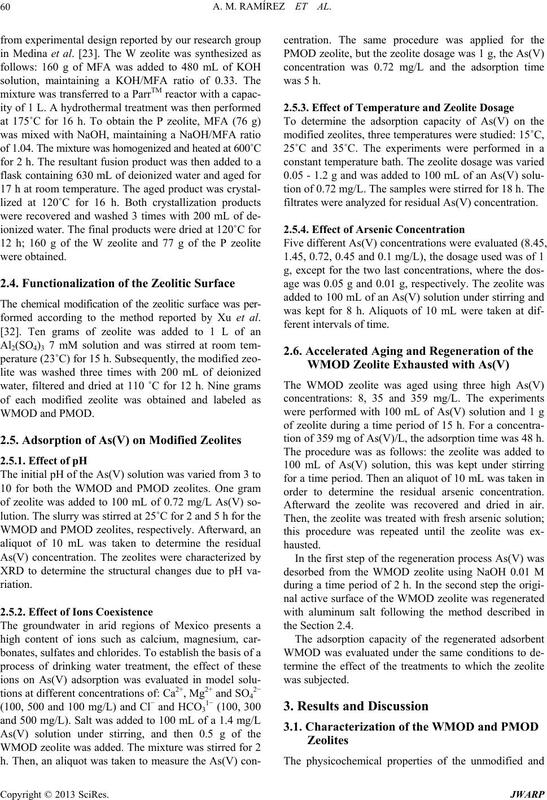 capacities (Qmax) were 76.11 and 44.44 mg of As(V)/g of zeolite for the WMOD and the PMOD zeolites, respectively. ment have led to a worldwide water crisis situation . the availability and quality of water resources are low. cancer of the skin, lung, bladder, kidney and uterus . thermal treatment carried out at 140˚C for 48 h .
litic surface have been reported [27,28]. ties of the adsorbent for its effective reuse . trepid II) according to ASTM standard E-1097-07. sion method) before carrying out the crystallization step. A. M. RAMÍREZ ET AL. formed according to the method reported by Xu et al. filtrates were analyzed for residual As(V) concentration. tion of 359 mg of As(V)/L, the adsorption time was 48 h.
order to determine the residual arsenic concentration. Afterward the zeolite was recovered and dried in air. tion treatment due to an increase in the aluminum content. textural properties were not affected. framework cation sites can be identified in merlinoite. Table 1. Zeolites physicochemical properties. and P zeolites (Adapted from Mortier ). perpendicular double crankshaft chains of tetrahedra. at pHo > 8, the As(V) removal was only 48%. ized zeolites [Co = 0.72 mg/L; dose = 1 g; t = 5 h]. critical for a zeolite’s chemical reactivity. ground-water of “Lag una” region . zeolite compared to the PMOD zeolite (1 g). constant were increased when the temperature increased. nature of the adsorption process for both zeolites. Table 2. 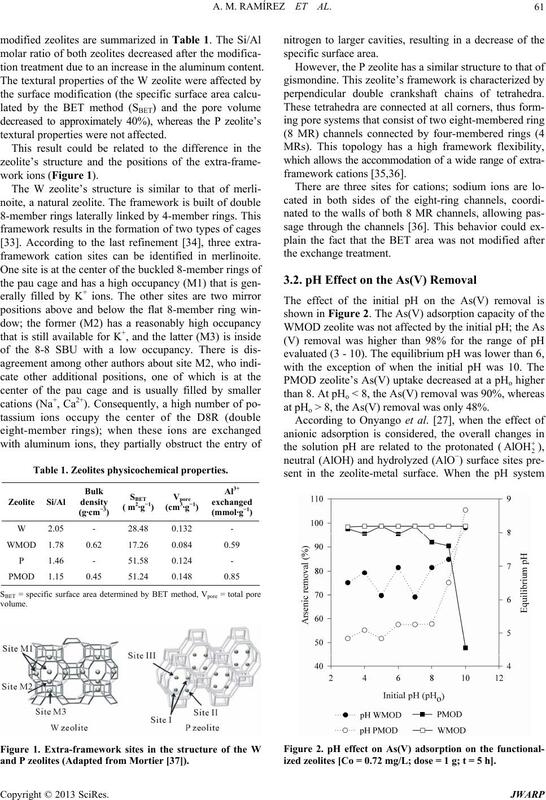 Effect of coexistence of ions on the percentage removal of As(V) on WMOD and PMOD zeolites. dsorption conditions: zeolite WMOD [As(V)] = 1.4 mg·L−1; dose = 0.5 g; t = 2 h; zeolite PMOD: [As(V)] = 0.72 mg·L−1; dose = 1 g; t = 5 h.
dose = 0.05 - 1.2 g; t = 18 h]. peratures studied, E was higher than 8 kJ/mol (Table 4). and nature of the adsorption process. The thermodynamic parameters are shown in Table 5. 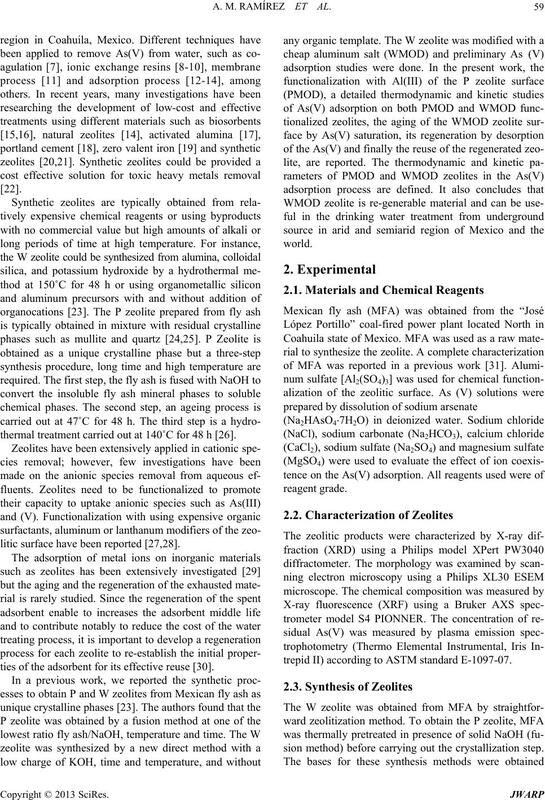 As(V) adsorption on the WMOD and PMOD zeolites. following linearized Equation (8) . plots of t/qt against t at different As(V) concentrations. These parameters are shown in the Table 6. Table 4. 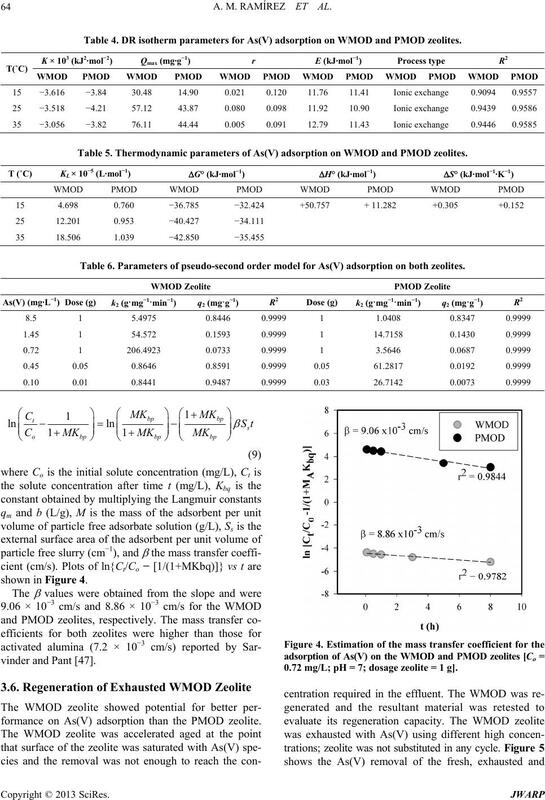 DR isotherm parameters for As(V) adsorption on WMOD and PMOD zeolites. Table 5. 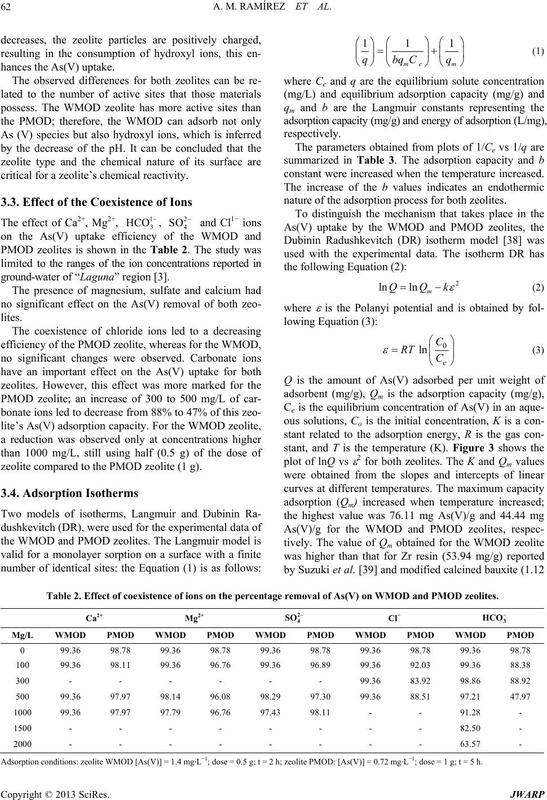 Thermodynamic parameters of As(V) adsorption on WMOD and PMOD zeolites. Table 6. 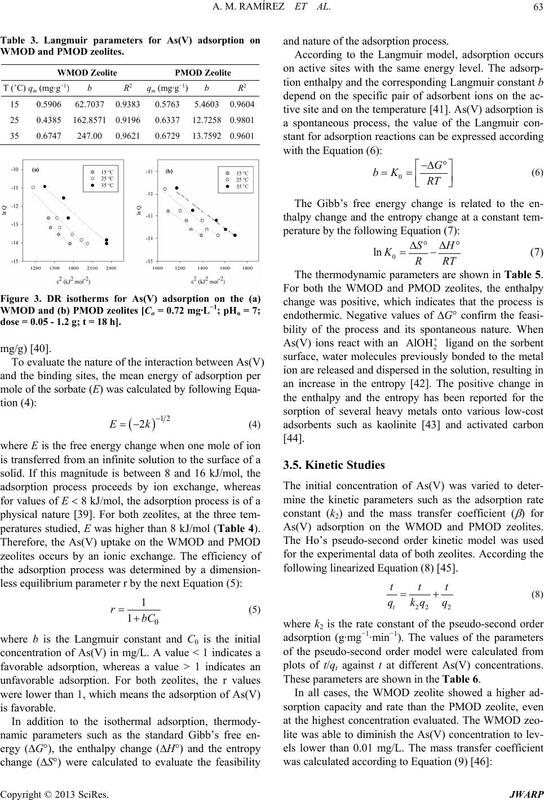 Parameters of pseudo-second order model for As(V) adsorption on both zeolites. 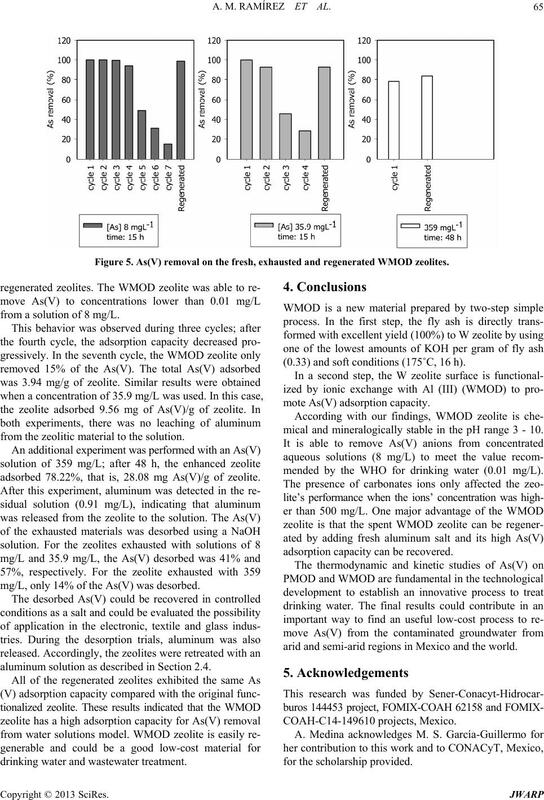 formance on As(V) adsorption than the PMOD zeolite. 0.72 mg/L; pH = 7; dosage zeolite = 1 g]. Figure 5. As(V) removal on the fresh, exhausted and regenerated WMOD zeolites. from a solution of 8 mg/L. from the zeolitic material to the solution. adsorbed 78.22%, that is, 28.08 mg As(V)/g of zeolite. mg/L, only 14% of the As(V) was desorbed. aluminum solution as described in Section 2.4.
drinking water and wastewater treatment. (0.33) and soft conditions (175˚C, 16 h). mical and mineralogically stable in the pH range 3 - 10.
mended by the WHO for drinking water (0.01 mg/L). adsorption capacity can be recovered. arid and semi-arid regions in Mexico and the world. porous Materials, Vol. 166, No. 1, 2013, pp. 37-49.
try and Health, Vol. 30, No. 4, 2008, pp. 345-353.
cology Applied Pharmacology, Vol. 198, No. 3, 2004, pp. Arsenic,” Minerals Engineering, Vol. 19, No. 5, 2006, pp. I. Peleanu, M. Zaharescu, I. Rau, M. Crisan, A. Jitianu and A. Technology, Vol. 37, No. 16, 2002, pp. 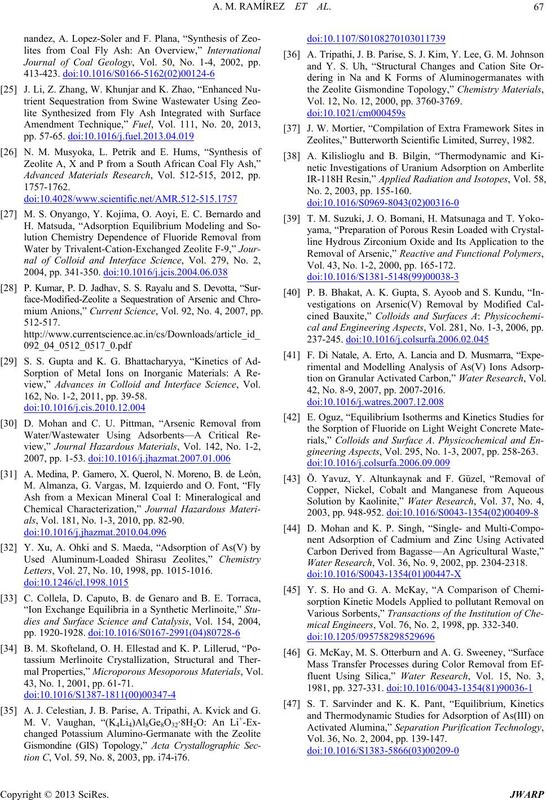 3693-3701.
ery,” Chemosphere, Vol. 66, No. 1, 2007, pp. 60-66.
nology Water Supply, Vol. 6, No. 2, 2006, pp. 201-207. A. E. Pagana, S. D. Sklari, E. S. Kikkinides and V. T.
terials, Vol. 110, No. 1, 2008, pp. 150-156. C. L. Chuang, M. Fan, M. Xu, R. C. Brown, S. Sung, B.
Vol. 61, No. 4, 2005, pp. 478-483.
oxide Adsorbent,” Chemosphere, Vol. 60, No. 3, 2005, pp. mental Monitoring, Vol. 3, No. 1, 2001, pp. 22-26. C. Y. Chen, T. H. Chang, J. T. Kuo, Y. F. Chen and Y. C.
nology, Vol. 99, No. 16, 2008, pp. 7487-7494.
neering, Vol. 19, No. 5, 2006, pp. 486-490.
nal of Canada, Vol. 39, No. 3, 2004, pp. 258-266.
search, Vol. 38, No. 14-15, 2004, pp. 3197-3204. C. Resmini, H. Gracher, N. Cabral, E. Angioletto, A.
of Arsenic,” Materials Science and Engineering: B, Vol. 177, No. 4, 2012, pp. 345-349. No. 20, 2011, pp. 758-767. A. Medina, P. Gamero, J. M. Almanza, A. Vargas, A.
ardous Materials, Vol. 181, No. 1-3, 2010, pp. 91-104. 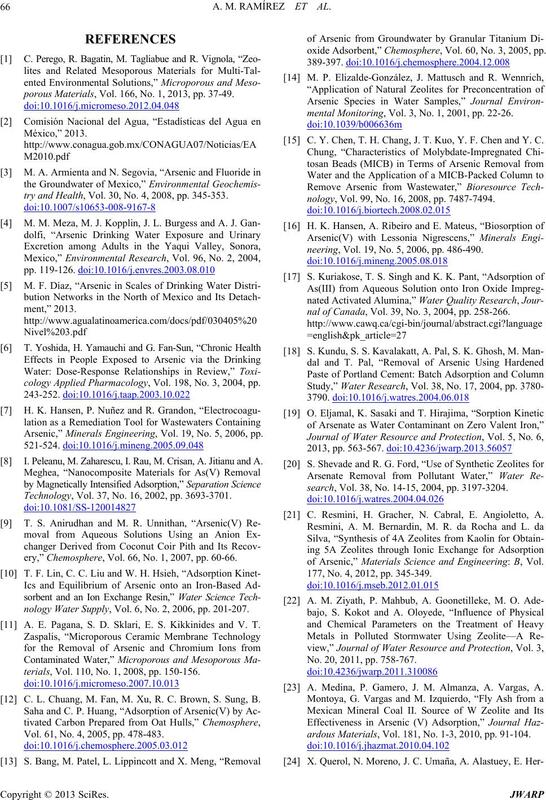 Journal of Coal Geology, Vol. 50, No. 1-4, 2002, pp. Advanced Materials Research, Vol. 512-515, 2012, pp. mium Anions,” Current Science, Vol. 92, No. 4, 2007, pp. view,” Advances in Colloid and Interface Science, Vol. 162, No. 1-2, 2011, pp. 39-58.
als, Vol. 181, No. 1-3, 2010, pp. 82-90.
Letters, Vol. 27, No. 10, 1998, pp. 1015-1016.
mal Properties,” Microporous Mesoporous Materials, Vol. 43, No. 1, 2001, pp. 61-71. A. J. Celestian, J. B. Parise, A. Tripathi, A. Kvick and G.
tion C, Vol. 59, No. 8, 2003, pp. i74-i76. Vol. 12, No. 12, 2000, pp. 3760-3769. Zeolites,” Butterworth Scientific Limited, Surrey, 1982. No. 2, 2003, pp. 155-160. Vol. 43, No. 1-2, 2000, pp. 165-172.
cal and Engineering Aspects, Vol. 281, No. 1-3, 2006, pp. 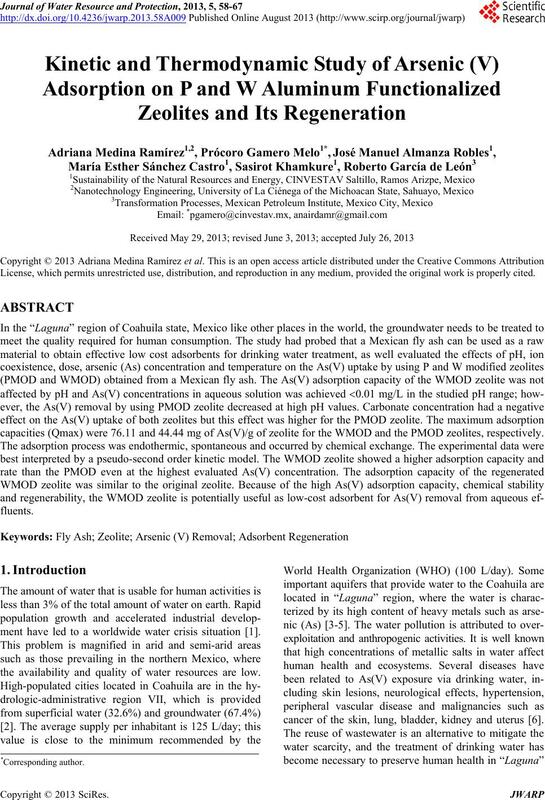 tion on Granular Activated Carbon,” Water Research, Vol. 42, No. 8-9, 2007, pp. 2007-2016.
gineering Aspects, Vol. 295, No. 1-3, 2007, pp. 258-263. Water Research, Vol. 36, No. 9, 2002, pp. 2304-2318.
mical Engineers, Vol. 76, No. 2, 1998, pp. 332-340. Vol. 36, No. 2, 2004, pp. 139-147.